Are you thinking of buying a real Christmas tree this year? You can get the freshest possible tree, grown right here on O‘ahu – all while reducing your carbon footprint AND supporting a really worthwhile organization, Mālama Hawai‘i. Partnering with Helemano Farms – located in Wahiawā – Mālama Hawai‘i is selling locally grown Christmas trees. 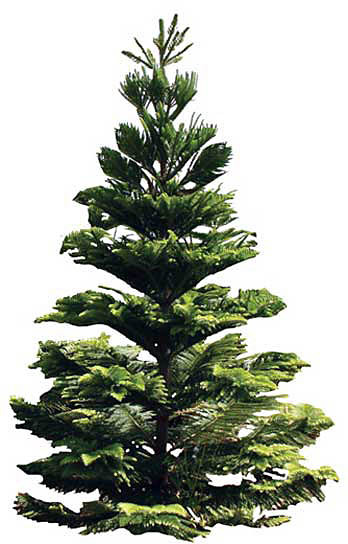 Helemano Farms, the only local Chirstmas tree farmers on O‘ahu, grow beautiful Norfolk pine trees, also known as the “Hawaiian Christmas Tree.” This species was originally brought to Hawai‘i about 80 years ago as part of massive reforestation efforts to restore watersheds. Rather than buying one of the over 100,000 trees shipped more than 2,500 miles that can be carriers of dangerous invasive species, consider Helemano Farms. Bring your friends and family and choose your own fresh tree from a farm of more than 10,000 trees. Helemano Farms cuts its Norfolk trees in such a way that each stump eventually will grow into a new tree. The cost is $40 for a 6 foot tree. Norfolks stay green, healthy and gorgeous for over a month. You can order a tree through Mālama Hawai‘i. To receive instructions on how to get your tree, email them at [email protected]. By purchasing your locally grown tree through this offer, you are helping to keep Hawai‘i beautiful in more ways than one – reducing your carbon footprint and supporting an organization dedicated to the people and environment of Hawai‘i. For a quick link to Mālama Hawaii’s contact info, please click here. For more information on Helemano Farms, please click here. Im Isabel, i just wanna ask where can i find u to buy ur fresh xmas tree bec. i worked there in wahiawa at kilani st. This is my 1st xmas here in hawaii so i want it to be memorable and unique bec. evrybody had artificial xmas tree. Please inform me about ur real address bec. we’re planning to buy later, lucky that i searched an ideas before i buy…THANK YOU and MERRY XMAS!!! Hope you enjoy the live, local tree.